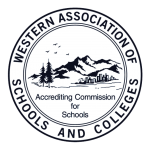 Verify our WASC accredited courses! Verify our AdvancED accredited courses! 1. https://www.advanc-ed.org/ 2. Click on "Find Accredited Schools" link at top of page 3. Type in LanguageBird for institution name 4. Click "search"
Verify our NCAA approved courses! 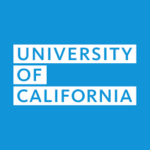 Find LanguageBird® on the University of California course list! For CALIFORNIA Counselors: Add LB courses to your high school's UC List. To add an online publisher’s course to a school’s “A-G” course list, the school will select “Adopt an online publisher course” from the submission menu once logged into the A-G Course Management Portal (https://hs-articulation.ucop.edu/agcmp). From there, select the online publisher’s name and course title. Once in the submission form, provide school-specific information, such as transcript abbreviations and/or course codes. Then submit the course for processing. Note: This can only be done between Feb. 1 and September 15th . What is LanguageBird's CEEB Code? LanguageBird does not have a CEEB code. Only schools issuing full high school diplomas have CEEB codes. LanguageBird® is accredited by the Western Association of Schools and Colleges (WASC) as a Supplemental Education Program due to the fact we offer only foreign language courses, not a full high school diploma. Do I need to take a test before my first lesson? No. Our teacher will assess your level from the trial lesson or from the first few minutes of your lesson and adjust accordingly. What if I’m an absolute beginner? No problem. Many of our students have never studied a foreign language before. ALL levels are welcome. We will start teaching where you are. What does the curriculum for courses for credit look like? The lesson by lesson curriculum will be provided upon request. The teacher follows the curriculum and it is loosely created around a textbook you will access digitally. 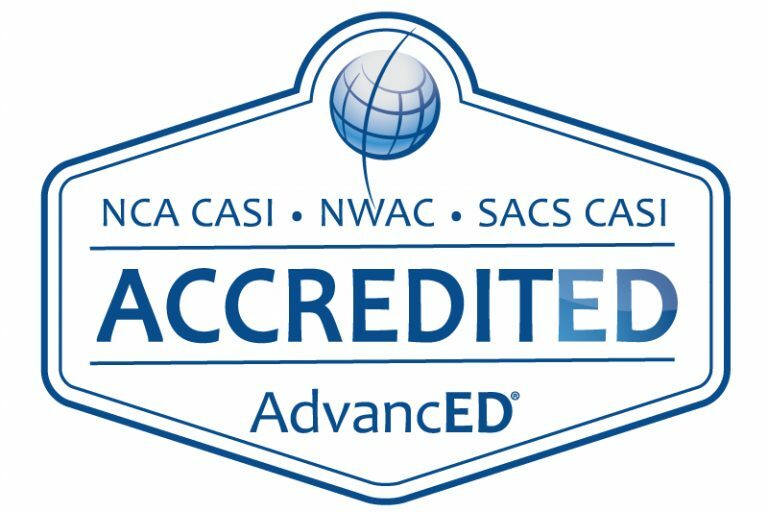 Our courses are WASC accredited and UC and NCAA approved. The curriculum is essential to give some structure to each lesson and ensure you grasp key concepts which will prepare you for future studies at the university and beyond! Is the class only in the target language? Does the teacher speak any English? This depends on your level. Immersion is the goal. Teachers are encouraged to strive for 90-100% Spanish during class. However, sometimes it will be helpful to use English for a quick translation or explanation and that’s acceptable. As you improve, English will become less and less necessary. Of course, if you are a very beginner (levels 1-2 +), all of our teachers are fully bi-lingual and will switch back and forth between English and the language you are studying. Do I need any materials for the class? If you are taking a course for credit, you will have a textbook. Details on the book access will be emailed to you upon enrollment. You can also see the course syllabus per language in our resource library once enrolled. All courses have a corresponding textbook. In some cases you will need to purchase access to the text (it can be borrowed, rented online or purchased). For some languages, LanguageBird provides access to the digital text free. In addition, students will use a variety of current and timely educational resources available online: pictures, music, news sources and cultural studies related sites. These will be provided online by the teacher or in the website resource library during the course. Yes! At the conclusion of your course, your teacher will assess you and give you a final grade. This may be at the semester or at the end of the full year courses. A grade of A-F (just like in school) will be given. This is only for courses for credit. How does a teacher assess/evaluate me? Your LanguageBird teacher stays with you for your entire course. Every time you go online you will meet with and create a relationship with the same person. This means they have the ability to observe your progress over time. Our philosophy is you can’t show what you know with only one test or assignment. You are assessed in terms of growth over time as well as your willingness to participate in conversation, attendance, homework completion and overall progress. You will have the opportunity after each lesson to get feedback from your teacher. At the bottom of your notes there will be a score from 1-10 (10 is the highest – A). This way, all along you will know how your teacher is assessing you. LanguageBird is project-based. At the culmination of the semester or full year course you will be expected to turn in a project to your instructor. This is a long term assignment that you will work on with your teacher as well as on your own. Depending on your level of study this could involve a variety of activities but will always include: research, writing, listening, creating and speaking. Your final project is turned in at the end of the course to your instructor. Often it is presented and your teacher will ask you questions. Sometimes it is filmed and turned in. The student will always have input and choice as to the topic of their project. How many lessons per week is best? Most of our students take 2-3 lessons a week. This is the best pace to keep up with your studies and not to forget any material. It also ensures you will complete your course in approximately 4-6 weeks per semester of study. This is much faster than a traditional class in school because it’s one to one instruction that’s personalized to you. There is no better or faster way to learn than one to one instruction. If your schedule does not permit you to take more than one lesson a week, that’s fine. Provided that you don’t skip any weeks, you will finish a full year of study in 24 weeks! That’s still much faster than a traditional class in school. If you are not taking lessons for credit, you can schedule your lessons as frequently as you wish. Again, remember, the more consistent you are, the more quickly you will see progress! Is there a limit to how many lessons I can take each week? There is not really a limit but it is recommended that you pace your lessons so that you have time to study on your own for one to two hours between lessons. While you are in your lessons you will be focused on oral components of the course. You will be making the most of your time with your teacher and be speaking and listening! When you are studying on your own you will be adding to your vocabulary, reviewing your notes from class, practicing writing and grammatical concepts… you get the idea. Will it be too hard for me? I didn’t have a good experience in my foreign language class at school or in the past. I’m worried I’m behind. No. Our teachers are patient and productive. They will quickly assess what gaps you may have in your learning and catch you up. With private instruction you won’t have to go over things you already know. They can just focus on the things you need to review and make sure you are up to speed. You may not be used to speaking as much as you will with LanguageBird if you have only been in large classroom environments. However, you will see quickly once you are a little bit familiar with your teacher, you will establish a relationship and not be shy to speak up or make mistakes and that is where the magic happens! You’ll see, you’ll start learning faster and faster and having fun! Will it be too easy for me? I’m pretty good at languages and even speak a little bit at home. Will this be challenging enough to get me speaking more fluently or reading at a higher level? Your course is tailored to you. At the higher levels, teachers and students work together to challenge each other and bring in materials that are interesting and challenging. You will be as challenged as you want to be! How do I book my lessons? You’ll set up the first lesson with a LanguageBird® administrator here in the U.S. After you are in contact with your instructor, you’re free to schedule with your teacher future lessons. Most stick to a consistent schedule (ie: Monday, Wednesday at 5 p.m. or Tuesday, Thursday, Saturday at 4 p.m. etc. What days and times are available for me to schedule classes? Most times. We try to be flexible to meet your scheduling needs. Depending on the language you are studying it may be more difficult to offer instructor availability at the exact time you prefer but we try and usually get pretty close. We offer lessons on weekdays as well as weekends. Some students like to learn early in the morning, sometimes it’s after school. Tell us what you need. Can I cancel a scheduled class? Yes – with at least 24 hours notice. Classes cancelled with fewer than 24 hours notice will not be refunded or rescheduled. See terms section of this website. What if I am late for a class? Classes start and end punctually. Your teacher may have time and be willing to extend the lesson a bit, but this is the exception rather than the rule. For students enrolled in the high school courses, they will need to pay for additional courses as needed. See terms section of this website. How do I meet my teacher online? Skype or Google Hangouts. Both are free to download and set up if you don’t already have an account. This is where you will video chat with your teacher face-to-face. No worries! Many of our students aren’t. Skype takes fewer than 5 minutes to set up and we can walk you through it. Google Hangouts only requires you set up a Gmail email account. Just give us a call at 1-844-700-BIRD or email us at support@languagebird.com. We can send you video tutorials to help. You can also use the camera built into your computer or an attached web cam, which is very easy to set up. Usually you just plug it into your USB port and are ready to go. Use of a camera is mandatory. It enhances the experience! A DSL, Cable or Fiber-Optic Internet connection. Skype. Download here for free. What are the backgrounds of the teachers? All of our teachers are native speakers who live abroad and live the culture and language you are studying daily. You will get the best understanding of the culture as well as the best exposure to an authentic accent. Each undergoes a rigorous interview process and is well qualified. These are not just native speakers who call themselves teachers – they are experienced, real teachers. Many have spent extensive amounts of time in the U.S. and many teach English wherever they are. They are all fully bi-lingual and most of all, they are passionate about wanting to share their language and culture with you! What if I want to change my teacher? Sorry to hear that! If there are any issues, we look forward to hearing your feedback and will be happy to assist. Just email us. Do I always practice with the same teacher? Generally yes. If you need to have a class at a specific time that is already taken, then you may be able to switch to another teacher. High school students meet with and schedule their entire course with the same instructor. No. In some courses of study it is required that you purchase digital access to the textbook. You can either buy or rent in most cases. We have taken special care to make sure that most all texts are not more than $60. We send you instructions on how to purchase the book (if needed) in your welcome letter. If you are taking a course for credit and you wish to send your final grades to a high school or college you are applying to, you may request to do so for a small fee on our "Certificate of Completion" page. LanguageBird sends via US Mail to high schools and electronically through Parchment to colleges nationwide. We can send a pdf by email without charge to a high school. How can I enroll in lessons or a course and pay tuition? Enroll on our website. We accept credit cards online. It’s safe and easy. 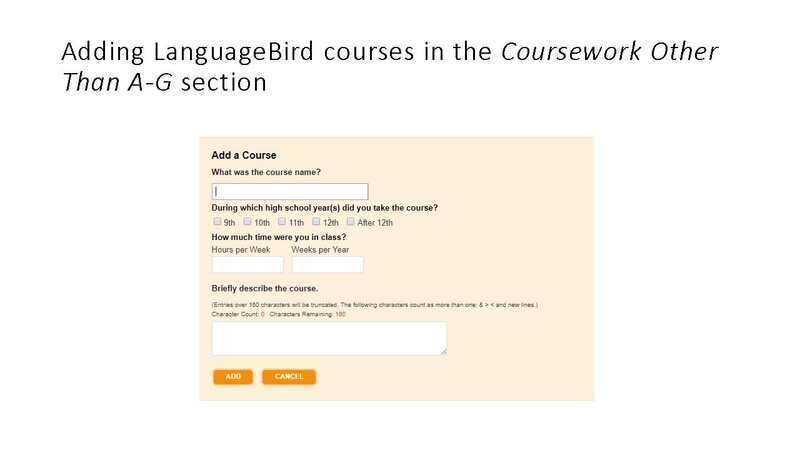 What is LanguageBird’s Course Tuition? 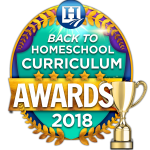 Full year course – 24, 1:1, private lessons $1997 Semester course – 12, 1:1, private lessons $1080 Pricing for tutoring/test prep and conversational lessons varies by the package and number of lessons purchased. Lessons are $50-70 depending. How do I request a certificate of Completion / Course Records / Grades? Please visit and fill out the request certification of completion form here. What do I need to take classes? A computer or tablet, an internet connection, and a headset are all you need. You may not even need a headset – many computers have microphones built in. If you’re not the best with technology, we’ll show you how to set everything up – it takes fewer than 5 minutes. What happens after I enroll in a course? Once you enroll in a course, tutoring or conversational sessions, we will contact you to schedule your lessons. We will match you to a teacher who is a great fit and available on your chosen days/times. For one year of high school foreign language credit, you take 24, private, one-hour lessons. For one semester, you take 12, private, one hour lessons. Between lessons students have 1-2 hours of work to complete on their own before the next class meeting. An online textbook is used in courses for credit and assignments are given to you by your instructor. Where are the teacher located? Our teachers live all over the world. You will learn about their culture and develop an authentic accent. It’s like going abroad without the passport, long flights and jet-lag. LanguageBird fosters cultural awareness, connectivity and dissolves boarders. What happens after I complete a course for high school credit? 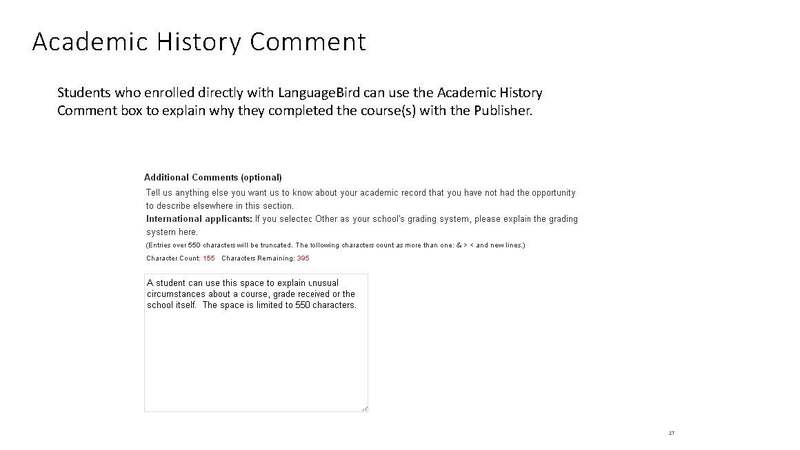 Once your course is complete, LanguageBird® will send your certificate of completion which includes your grade in the semester or full year course to your high school or to the college/university of your choice. Will I get course credit from my high school? The LanguageBird® foreign language program is designed to help students develop foundational communicative skills in foreign language studies and help prepare them for future college courses. 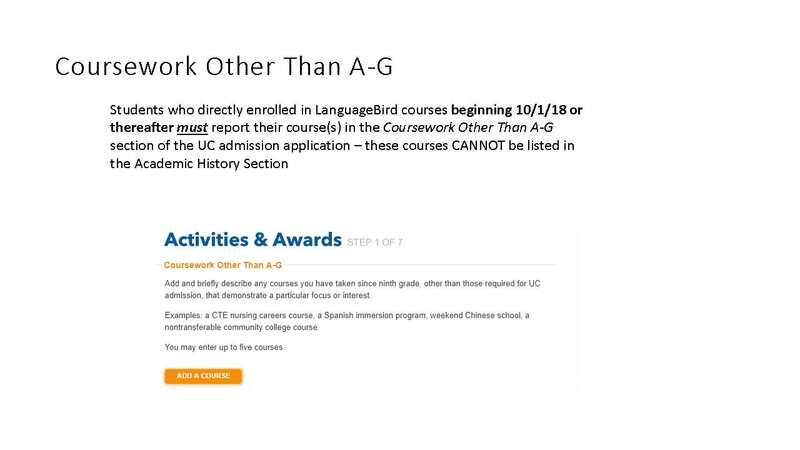 LanguageBird® is WASC accredited which is the highest standard and what most high schools look for in order to grant credit for a course outside of their own curriculum. 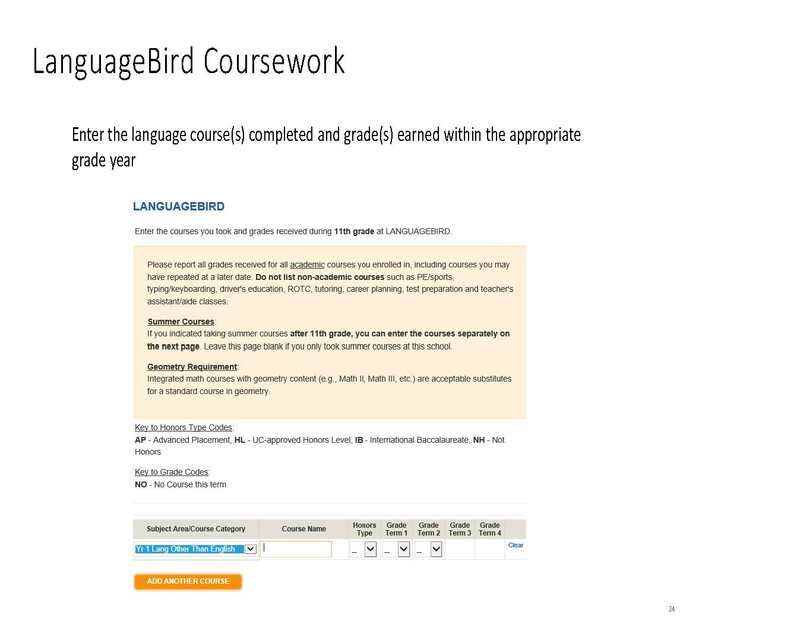 We recommend you talk to your school counselor and let them know you would like to take a LanguageBird® course if it is required for your high school graduation credit (most high schools require 2 years of foreign language). 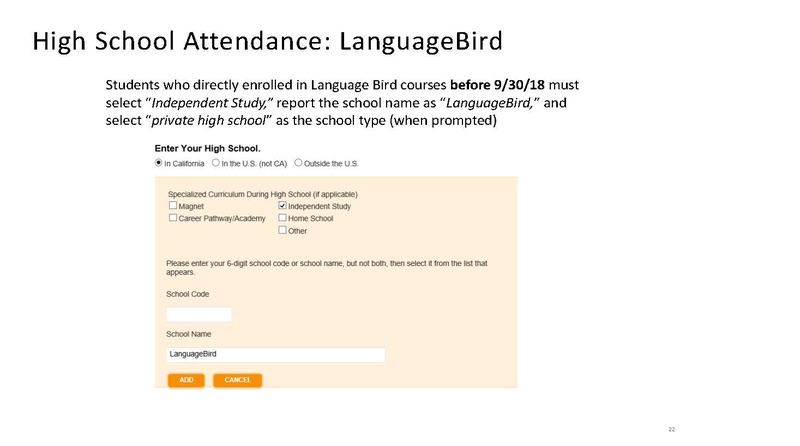 Some high schools will fill out a concurrent enrollment form and ask you to bring in or send a certificate of completion once your LanguageBird® course is finished. We are happy to work with your high school administrator and counselors! What if I do not need course credit from my high school but want to take courses? If your course is not for credits toward graduation from high school, you are taking our courses to further your studies in the language, make time in your schedule, show competitive colleges you are dedicated student, etc. you don’t need to get permission from your school. If you do let them know you are taking extracurricular courses, it could help them with your college advising, scheduling, and more. Some school districts/schools have a policy to include or not to include outside courses on their transcript. You will need to ask the school about their policy. How do I send my certificate of completion to my school? LanguageBird® will send your certificate of completion and final course grade to your high school and/or to colleges of your choice. We can send it electronically (email or by Parchment) or through U.S. mail. FREE. We are so confident that you will love lessons with us, we invite you to try our course out with one of our teachers for 30 minutes free of charge. We do ask that you respect our teacher’s time and if you need to reschedule, you give 24 hours notice. How long is the trial lesson? 30 minutes. The trial lesson is a brief introduction so a student can see what it’s like to learn with LanguageBird. You don’t need to study or prepare ahead of time, just hop online 5 minutes before your scheduled time and relax. Your teacher will meet you and guide you through a mini-lesson. Call us at 844-700-BIRD or email support@languagebird.com . One of our friendly staff members will then be in touch (assuming you haven’t spoken already) to learn about your goals, ensure the lesson is tailored for you, and schedule your time. Must I create an account to learn with LanguageBird® ? If you don’t have a Skype account or gmail address you will have to create a new account. Skype or Google Hangouts are both free to use and download and completely safe. Ask us if you need help setting up one of these video conference accounts. What do I need to prepare for the trial lesson? Nothing. Just log into Skype 5-10 minutes ahead of time and your teacher will connect with you. Just enjoy it!